Nail art made easy with Kiss, Sally Hansen and Ciaté! Kiss Salon Secrets Nail Art Starter Kit - $16.99 - contains a huge assortment of different art components including: 3 nail art brushes - to create unique designs or gather glitter to lay onto nails with precision; dotting tool - to draw perfect dots and create intricate swirl designs; foil tape - for creating accented patterns and shapes or outline polished nail designs; pre-cut nail art sheet and design decals; 6 HD glitter pouches; top coat; and a pro design guide containing step-by-step directions from professional nail artists. Available at Walmart, London Drugs, Jean Coutu and Target. 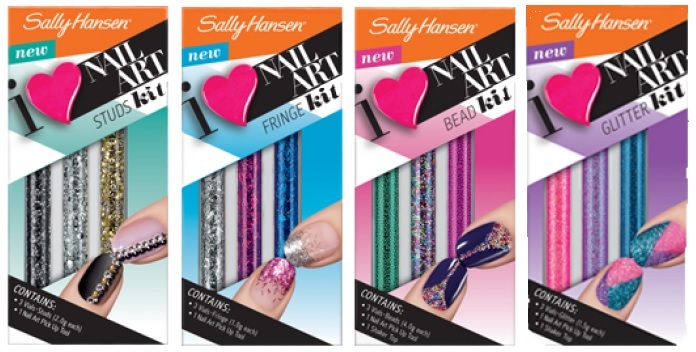 Sally Hansen I Heart Nail Art Kits - $5.95 - in Studs, Fringe, Bead and Glitter options that create stunning depth and texture. Each set contains three embellishment colors to create rich, brilliant looks and create works of art on each nail! Ciaté Feathered Manicure - $30 - in 3 colour choices, my fave is this one called "What A Hoot" - a complete nail kit featuring 40 natural ethically sourced feathers; speed coat pro, mini paint pot, nail scissors and 2 nail file blocks to create a stunningly intricate nail art look.